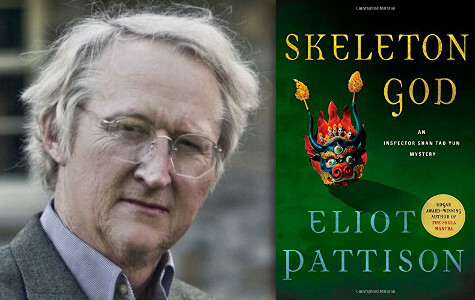 The Baltimore Post-Examiner is proud to publish an excerpt from Elliot Pattison’s latest book “Skelton God.” In Pattison’s latest book Skeleton God, Shan Tao Yun, the reluctant constable of a remote Tibetan town, has learned to expect the impossible at the roof of the world, but nothing has prepared him for his discovery when he investigates a report that a nun has been savagely assaulted by ghosts. 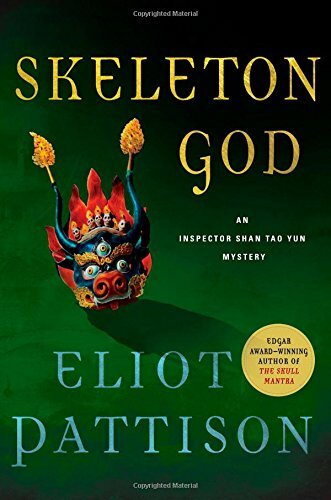 In an ancient tomb by the old nun lies a gilded saint buried centuries earlier, flanked by the remains of a Chinese soldier killed fifty years before and an American man murdered only hours earlier. Shan is thrust into a maelstrom of intrigue and contradiction. The Tibetans are terrified, the notorious Public Security Bureau wants nothing to do with the murders, and the army seems determined to just bury the dead again and Shan with them. No one wants to pursue the truth–except Shan, who finds himself in a violent collision between a heartbreaking, clandestine effort to reunite refugees from Tibet separated for decades and a covert corruption investigation that reaches to the top levels of the government in Beijing, China. The terrible secret Shan uncovers changes his town and his life forever. If you would know the age of the human soul, an old lama had once told Shan Tao Yun, look to Tibet. Here at the roof of the world, where humans were so battered, where wind and hail and tyranny had pounded so many for so long, it was a miracle the human spark remained at all. As Shan gazed at the old Tibetan herder beside him, knee-deep in mud, grime covering his grizzled, weathered face, and saw the eyes shining with the joy of life, he knew that he was looking at something ancient and pure. In Tibet souls were tried, and souls were tormented, but always souls endured. “Put your back into it, Chinese!” the old man gleefully shouted, revealing two missing teeth, then twisted the tail of the yak in front of them. Shan leaned into the dank hair of the animal’s hindquarters. With a loud bellow the huge yak strained at the mud that trapped it, then sank back. The four Tibetans he was with were called ferals, not because the old couple, their granddaughter, and her son exhibited the wildness of their remote mountain home, but because they numbered among the few Tibetans who refused to register as citizens of the Chinese government. Their precious bull yak had become mired in the soft mud of a river crossing uncomfortably close to the township’s main road, and Shan, standing up to his knees in the ooze as he pushed the gentle, massive creature, did not miss the worried glances the old Tibetans began casting down the road. The young woman in the battered truck eased it into gear, tightening the rope around the animal’s chest, propelling such a shower of mud onto the yak and Shan that the boy in the back of the old pickup burst into laughter. The rope tightened, the yak snorted, and Shan and Trinle strained against the hairy haunches. A single yak, provider of hair for the felt used in tents, blankets, and clothing, milk for nourishment, and dung for fuel, could mean life or death to such impoverished nomads during Tibet’s harsh winters. A shadow fell over her and she froze. Sensing disaster, Shan gave up trying to rinse away the mud and threw himself into the frigid water. With a shudder he stumbled across the stream to the side of Trinle, who stood still as a statue, murmuring hasty mantras. Shan gazed at Yara in disbelief. Had she not recognized the officer’s gray uniform? Did she not know she was arguing with a knob, an officer of the dreaded Public Security Bureau, whose own patrols had replaced all the road signs with ones that displayed the new Chinese names given to the remote Tibetan towns? Yara’s eyes flared. “Prisoners?” Her gaze moved toward the frightened Tibetans now visible in the rear of the truck, most wearing the fleece coats of the dropka, nomadic shepherds like her own family. “Accused of living a life too far from Beijing’s grasp, you mean,” Yara shot back, in the scolding tone of the schoolteacher she had been before tearing up her identification papers. Shan urgently pushed Trinle’s shoulder. The old Tibetan turned and saw that his wife and Ati were now leading the yak up the wide grassy slope, away from the road, and hurried after them. “Yara!” he called in a voice full of fear, then turned and ran up the slope. Shan headed to his truck and grabbed the dark blue tunic lying in its bed. “I have some tea in a thermos,” the Chinese lieutenant offered. To Shan’s astonishment the officer grinned. “My name is Jinhua,” he declared again. Perhaps thirty years of age, he had a slight build and an almost boyish face, except for its restless, calculating eyes. Shan slipped on the tunic, straightening it over his still-dripping back as he stepped beside Yara. She turned, saw her retreating family, and slowly backed away, the officer’s eyes still fixed on her. For the first time, it occurred to Shan that the slender Yara, with her high cheekbones and deep, brilliant eyes, was a strikingly handsome woman. He stepped closer, blocking the officer’s gaze. As Shan opened the door of his truck, he glanced back at Yara, who was running toward her family now. On the long grassy slope beyond her, a rider on horseback was galloping toward the shepherd family. He pointed to his truck to keep Jinhua’s attention away from the ferals, who otherwise might end up with the prisoners. The lieutenant shrugged. “Through mutual sacrifice our nation will reign supreme,” he replied, reciting the slogan from Beijing’s latest propaganda poster. Shan pulled his truck onto the macadam, and Lieutenant Jinhua tossed his keys to one of the soldiers and climbed into the cab with Shan. As they threaded their way up the long switchbacks that led to Yangkar’s high valley, the knob looked out the window with the gaze of the inquisitive tourist. After a few minutes he lifted the little Buddha carved of stone that sat on the dashboard. “Four hundred thirty-two Chinese grateful that Beijing is so far away,” Jinhua said, as if correcting Shan. “Life here is just one miracle after another,” Shan said. “You just need to know how to look for them.” He glanced uneasily at Jinhua, who had pulled a map from the dashboard and was studying it. Shan knew from painful experience never to trust a knob who behaved so casually. Even a junior lieutenant had the authority to throw someone in jail for a year on his signature alone. YANGKAR. Half a dozen Tibetans on bicycles, having seen Shan’s warning light, rode hurriedly by in the opposite direction. The mechanic in the town’s only garage paused in repairing a tire to stare at their little convoy. Ahead of them in the small town square a young nun halted her work on a little onion-shaped structure with a steeple on it, a small chorten shrine, and rushed to the curb, trying to see inside the truck as it slowed. Passersby stared silently. All activity in the town had stopped. Suddenly a gunshot broke the silence. Frightened onlookers darted into buildings and alleyways. As Shan slammed on his brakes and leapt out, the soldiers erupted from the prison truck, cocking their weapons and aiming them toward the few remaining townspeople before looking toward their sergeant, who had darted twenty feet away from the truck before stopping. “Someone threw in a device!” he shouted at Shan. “Lit the fuse and ran!” He waved his still-smoking pistol toward the Tibetans on the street. The sergeant was an older career soldier, probably well aware that Tibetans in the remote mountains had once waged a dogged resistance against the Chinese. “Don’t go up there, you fool!” he warned as Shan climbed in among the prisoners. He watched as an old woman walked along the two benches, pausing by each of the occupants to touch them with smoke from the bundle of incense sticks she now held in her hand. He tossed the bundle to the sergeant, who let it drop to his feet, then angrily stomped it with his boot. Shan guided the truck to the front of the one-story stucco building facing the center of the town square. A small cordon of residents had already assembled by the station’s door. He recognized Mrs. Weng, proprietress of the town’s largest store, Mr. Hui, the town dentist, and Mr. Wu, the town clerk. They had anointed themselves as the Committee of Leading Citizens, an adjunct of the township Party apparatus. All were Chinese. Shan ignored their approving nods as he led Jinhua inside. He passed through a sparse outer office into the darkened room beyond, where two cell doors hung open. Switching on the row of naked light bulbs that ran down the center of the ceiling, he lifted a uniform cap from the table and tossed it at the figure lying on one of the cell cots. The middle-aged Tibetan on the cot rolled over, rubbing his eyes, then shot up as he saw the soldiers behind Shan. He grabbed the tunic stuffed between bars of the cell and hastily pulled it on. Jengtse straightened and awkwardly saluted as Lieutenant Jinhua approached, followed by the army sergeant, then flushed as the sergeant jeered at him and gestured to the prisoners. “Six to a cell,” the sergeant ordered the deputy. Jengtse, who had served twenty years in the People’s Liberation Army, mostly along the Russian border, dutifully hastened to retrieve the keys from the table. Jinhua lowered himself into the chair at Shan’s desk and watched with an amused expression as the office, crowded with prisoners and soldiers, gradually assumed a degree of order, with the frightened Tibetans being herded single file into the cells and the soldiers bringing their packs from the truck into the office. Jengtse locked the cells and turned to Shan with a despairing expression. They had both seen the tags pinned to the clothing of each prisoner, even the two children. Yi, er, san, si. One, two, three, four, and on up to twelve. The prisoners had lost their names. They were part of the wave of displaced persons coming off the high plains, where army patrols had been sweeping, scouring away the nomadic families who had lived there for centuries. When they arrived at the internment camp they would be given new, Chinese names. After a few weeks of reeducation focused on the ever-correct ways of the motherland, the adults would be sent to factories in distant provinces and the children to boarding schools, not to see their parents for years, if ever. The small door at the back of the cell block suddenly opened. “Shan! Constable Shan!” called the woman even before she had stepped inside. “The dead are rising!” It was Yara, whom Shan had last seen escaping toward the mountains. Tears stained her dusty face. “You must—” Her words choked away as she saw the soldiers. She looked at the prisoners and visibly shuddered. Her eyes welled with moisture and she backed away, leaving the door open as she fled. How could she have made it to town so quickly, Shan asked himself, then remembered the rider who had been galloping toward her. A surprised murmur left Jengtse’s throat, and he bent to pick up something Yara had dropped. He studied it for a moment, then looked up at Shan in alarm, glanced at Jinhua, and stuffed it in his pocket. “Two hours?” the sergeant asked. The sergeant gave a discontented grunt, then studied his six weary men. “Bedding in the closet,” he repeated. As he hurried his men outside, Shan turned to Jinhua, still sitting at his desk. The knob stared at Shan for a moment, then shrugged. “Perhaps there’s something that resembles a café in your metropolis?” the lieutenant asked. Jinhua’s cool grin sent a shiver down Shan’s spine. The knob bowed his head as if surrendering, then rose and stepped out to the street. Shan returned to the cell room and found Jengtse staring at the object Yara had dropped. “Old beads,” the deputy observed. It was a mala, a Buddhist rosary. “Bone. Made of bright white bone,” he added pointedly and dropped them on the table in front of Shan. But the beads weren’t white; they were so pink Shan at first thought they were made of coral. As he lifted them from the desk his heart went cold. The bone beads, each intricately carved into the sacred image of the eternal knot, were sticky. They were covered in blood. “Nyima!” a woman gasped from the nearest cell. She was staring at the beads. “Nyima?” Shan asked his deputy. “Where does she live?” Shan asked. The mountains to the north. She could be anywhere in a hundred square miles. Shan realized that Jengtse was staring over his shoulder. He turned to see the woman who had spoken the nun’s name reaching out through the bars. She was staring at the bloody rosary. “Where did these prisoners come from?” Shan asked his deputy. The woman, in her late thirties, looked up at Shan in silent pleading. Her eyes, welling with tears, were of an unusual green color. “Do you know the nun?” he asked as he approached. “Nyima,” the prisoner said again, and snatched the beads out of his hand. “Where is she?” Shan asked, but the woman seemed not to hear him. “Nyima,” she repeated in an anguished tone, then retreated to one of the cots and sat with the beads stretched between her fingers. When he asked again, more loudly, she sobbed and buried her head in her hands. Shan pushed down his anger and stepped past his deputy. Rikyu, the young nun who maintained the town shrines, was standing outside. She quickly buried her hand in the folds of her robe. Shan just as quickly pulled her arm away. Rikyu was holding a small, once elegant prayer wheel, now smashed nearly flat. Its copper surface was embossed with silver images that appeared to have been dancing leopards. “Show me,” Shan said, pushing the nun inside and pointing to a map pinned to the wall. Rikyu indicated a circuitous dotted line that ran from the highway north of town and ended at the base of a steep ridge. “She probably just fell. I will go see her. Not for you to worry about,” she said, meaning it was Tibetan business, for Tibetans to worry about. Jengtse grimaced but obeyed, muttering his disapproval as he left the building. Rikyu hesitated a moment, as if seeing something new in Shan’s eyes. During Shan’s first weeks in office the nun had kept her Bureau of Religious Affairs registration, her license to wear a robe, pinned conspicuously to her clothing, and behaved like a submissive servant whenever Shan approached. Shan had finally taken her into the office and made a duplicate of the license on their creaky old copier, then told the nun he would just keep it on file so the nun would not need to display her papers. Afterward she had seemed even more skittish, and Shan had realized Rikyu had taken his action as a threat. washroom before eating.” He pointed to the keys hanging on a peg by his desk. “No one else in the building while I am gone. And no, Mr. Hui,” he said as he saw the dentist’s jealous glance toward the weapons locker. “No firearms. No one in the cells committed an act of violence. A bowl of noodles for each prisoner,” he repeated to Mr. Wu, the town clerk, whom he took to be the most dutiful of the three. “And tea for all. My surveillance cameras will tell me if you fail to comply.” The committee members stiffened and nodded their understanding. Mr. Wu cast a furtive glance toward the ceiling as if looking for cameras, then offered a clumsy salute. As they left town, Jengtse carefully arranged the little Buddha on the dashboard so the god was looking ahead of them. “We don’t have cameras,” he observed. “You should be more realistic,” his deputy said. “Maybe pencils and paper, but anything more and they will just—” His voice trailed away as he pointed toward the slope above town. Shan pulled over and focused his binoculars on the pass. Figures on horseback were hurrying up the long slope from below, converging on the pass that led into the high ranges. Shan looked through the back window. Rikyu, sitting on a bundle of blankets in the bed of the pickup, was pointedly ignoring Shan as she pressed her mala to her lips. She was frightened. The dead are rising, Yara had said. The old truck wheezed and groaned as it climbed the overgrown road indicated by Rikyu. It was a region Shan had not yet explored, the far northwestern tip of Lhadrung County, known for its high, inhospitable ridges that rose up like fortress walls to isolate the lands above. The road faded into grass-lined ruts, then abruptly ended at a broad clearing surrounded by rock outcroppings. “She lives in a cavern on the first flat, by the ice caves,” Rikyu explained as she climbed out. Shan followed her arm toward two flats above them, separated by a steep embankment. He made out the heads of several people who were watching them from the second, higher, flat. Rikyu cinched up her loose robe and began running up the worn trail. The old nun lay in the narrow gap between two outcroppings near the top of the path to the second flat, a surprisingly broad, level plateau that extended for nearly half a mile. She had been struck on the head with a vicious blow that left a ragged, open cut across one temple. Blood oozed down her jaw and onto her neck. One hand was bloody, with two fingers bent unnaturally, obviously broken. Her robe was spotted with blood. Rikyu already sat beside her, clasping the woman’s uninjured hand. “Om mani padme hum,” Rikyu murmured, the mantra that invoked the Compassionate Buddha. Nyima pulled her hand from the young nun and waved it back and forth as if to dismiss him. “It’s nothing, a trifle,” she said in a cracking voice. “Find my donkey. The amchi will have me right,” she continued, using the term for a traditional Tibetan doctor. Shan followed her gaze toward a small group of Tibetans thirty yards away, gathered around a patch of ground covered with tufts of grass and lichen. “Hal lei lu jah,” the old nun murmured, “hal lei lu jah.” It was not a mantra Shan had ever heard. He felt conspicuous, out of place, as he approached. The old nun did not want his help. None of the Tibetans wanted his help. Not for the first time Shan silently cursed Colonel Tan, governor of Lhadrung County, for forcing him into the blue tunic. He longed for the tattered work clothes he had worn for years, clothes that would have allowed him to sit beside these simple, reverent Tibetans. A woman retreated behind a sturdy-looking herder as they saw Shan. Two children were quickly sent away toward the sweat-stained horses now grazing at the end of the plateau. Trinle did not want to answer. He glanced uneasily at his wife Lhamo, who stood with the ring of Tibetans, then stared at a black crack in the ground. “It has found us!” cried out a middle-aged man Shan recognized as a farmer who lived near the town. “A ghost has summoned us to its entrance! A bayal!” he exclaimed, referring to one of the mythical paradises that were said to be hidden underground, revealed only to those of great virtue. “Nyima heard it call out from the ground yesterday, then again this morning. Hal lei lu jah,” the man said and touched the gau, the prayer amulet, that hung around his neck. Knotted into the cord of his gau—knotted or stuffed into every gau visible to Shan—was a twisted piece of green paper. “I don’t understand,” Shan said. “It is for the pure of heart,” the woman beside the farmer replied, as if to explain Shan’s ignorance. “Hal lei lu jah,” the farmer repeated. “It must be what the ghosts say, to summon us. Yesterday, and again today, the same time each day. We have all come to hear it, so we can learn their secrets at last!” The old man pointed to the narrow opening in the earth. “At last it is time for us to cross into it!” He turned to the woman beside him. “Should we prepare a bag of food for the journey?” he asked her. Shan paced along the little crevasse, which revealed nothing but deep shadow below, then surveyed the plateau. “What is this place?” he asked. The Tibetans near him looked away uneasily. Shan dropped to his knees, exploring the grass-lined edge of the opening, then pulled up a tuft of grass to reveal the straight edge of a carefully chiseled stone. The tuft had not been rooted there; it had only recently been pushed into the loose soil covering the stone as if to conceal it. “Blessed Buddha! It’s a door!” the farmer exclaimed and dropped to his knees, pulling more tufts. His wife knelt beside him to help scoop away the soil, then a third man bent to help. Soon they had revealed a carefully cut stone slab, eight feet long and nearly six wide. “Terme!” one of the women said, meaning Buddhist relics and teachings that had been buried or hidden in Tibet during earlier centuries, waiting to be found by the devout of the future. As Shan walked around the slab a great foreboding seized him. Rikyu, the young nun, had run to Nyima to report the discovery and was now sprinting back, her robe streaming behind her. “Stop!” Jengtse took up the cry, with surprising vehemence. He grabbed the arm of one of the men, who resentfully shook him off. No one seemed to hear. The farmer grabbed a shepherd’s staff, inserted it into the crack, and began prying up one edge of the stone. The farmer with the staff gestured for the other men to grab the slab as it rose on his lever. “Not even a saint could get out of that hole by himself,” he muttered. Suddenly Shan saw Lieutenant Jinhua standing a few feet away, staring with a predatory expression at the stone slab. “Wait!” Shan called out, and pushed through the Tibetans to intercept the knob officer. But it was too late. The lever had raised the stone high enough for the excited Tibetans to grip it, and they were lifting the slab. They groaned, staggering under the weight, then lowered it onto the grass beside the hole. One of the women screamed and staggered backward. Several of the Tibetans began running away. Others grabbed their prayer amulets or rosaries and began urgent prayers. Trinle collapsed onto his knees, staring wide-eyed. The lama lay in a wide tomb carefully lined with more stone slabs, his hands folded over his belly, the lids of his closed eyes painted vermilion, his mummified face, like all his exposed skin, covered with gold gilt. It was a burial of the distant past, probably hundreds of years old, the kind indeed reserved for the most saintly of teachers. The mantras changed and grew louder. The remaining Tibetans weren’t making the traditional request for compassion now, they were asking for forgiveness. Only Lieutenant Jinhua moved, shoving past the stunned Tibetans. He knelt at the edge of the tomb, then lowered himself onto his belly to study the mummy. “He was calling out,” the knob observed. rug that covered much of the body, so large it was bunched against the sides of the tomb, he stepped closer and reached out. Clenching his jaw, he pried up the topmost hand. The long-dead lama was holding a cell phone. Shan retrieved the device and, ignoring Jinhua’s outstretched hand, pressed the large green button. As the screen sprang to life, he stared at it, disbelieving. All the words were in English. He pushed the button for the ringtone. “Hallelujah,” sang a chorus. He looked up into a circle of confused faces. Shan let Jinhua reach down and grab the phone out of his hand, then lifted the old carpet in each hand to fling it forward, and froze. The Tibetans, including the nun, backed away, gasping, some now clutching their bellies. Jengtse cursed and lifted the staff as if for protection. Shan, dropping the carpet, found himself flattened against the end of the tomb, his heart thundering. The hideous, desiccated body Shan had exposed to the left of the lama was that of a Chinese soldier, dead not for centuries but probably for decades. The one on the right was of a Western man, dead for only hours. Copyright © 2017 Eliot Pattison.